In 2016, I had the opportunity to advise Sevilla, one of the biggest Spanish La Liga teams, when they were exploring the possibility to use Beyond Sports, one of the pioneering companies in Virtual Reality for football to enhance performance. Below is an overview of the most relevant features that this solution provides. Apart from any potential feeling of nostalgia about how simpler and more pure football was in past decades, with no data and not so much technology around, the willingness to constantly innovate and to try out alternative solutions to given problems is the cornerstone and main virtue of the greatest institutions in the world, whatever the industry. The Dutch National Team, AZ Alkmaar and PSV are the first teams to start using Virtual Reality to enhance performance. Now, the German Federation has announced they will start using it. The amazing work that the German Football Federation (Deutscher Fußball-Bund, DFB) has been doing around talent development in the past 15 years is one of the most solid and effective ever seen. But its greatest achievement resides not in the content of their Curriculum (which is considerably strong), but in one of the most valuable principles that any organization can have: a culture of innovation. Culture of innovation tends to be the main virtue of the greatest institutions in the world, whatever the industry. Thanks to this ability to innovate by the DFB, soon will be widespread globally a new training method, which has its origins in other sports but which is already used by the Dutch National Team, PSV and AZ Alkmaar: Virtual Reality (aka VR) to enhance the decision process and thus performance. By “enhance the decision process” I mean (1) To increase the percentage of overall good decisions; (2) To increase the speed at which those good decisions are being made. During the past season (2016/17) I had the opportunity to act as an advisor for Sevilla, one of the most important teams in the Spanish La Liga, on a specific project. The idea was to start using Beyond Sports for the First Team, as well as the Youth Academy. 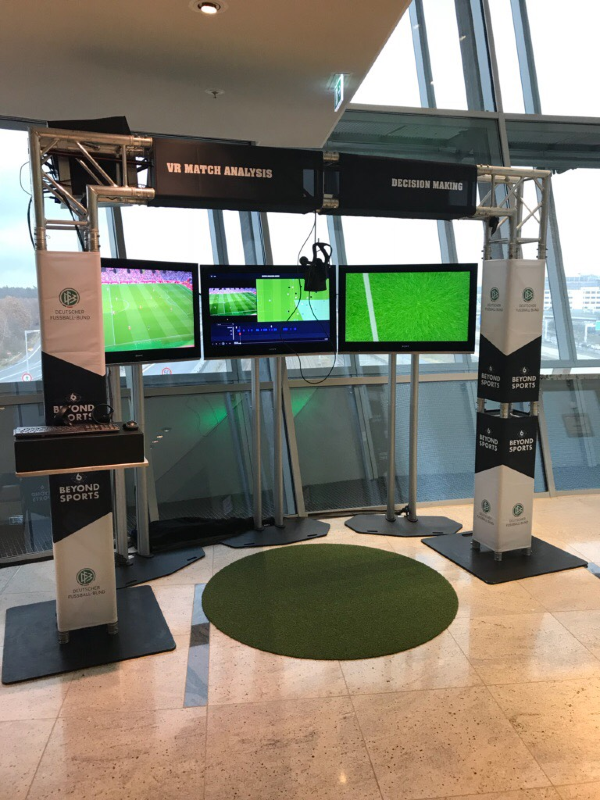 Beyond Sports is one of the pioneering companies in VR for football. Below (and this is not sponsored content) are shown some highlights of this solution. The German Federation (DFB) has just announced they will start using Virtual Reality in all their teams (including the First Team) to improve decision making. What is it? How do we train using VR? Beyond Sports (and probably any other VR solution) focuses on enhancing the decision making process and on increasing the speed at which those decisions are being made. All of this using Virtual Reality (VR). The player uses a VR equipment (helmet, Oculus Rift or glasses) and experience a game live. VR allows to improve the decision-making process by simulating real scenarios (often designed by the Coach and his team), so that the player can indicate what would his decisions be under those scenarios (using a kind of joystick). All of this with no extra physical load. Option #1: Revival of matches. One cool feature is that the last game can be replayed, or re-experienced. For example, imagine Barcelona playing the derby against Real Madrid. Gerard Piqué could play again the same match, under his position as defender (or any other) and check specifically what decisions he would change in certain moments of the game: pass between the lines vs drive with the ball, provide width to take a mark with him, etc. Option #2: Tailormade training scenarios. Another option is to create customized scenarios, so that players can enhance their tactic intelligence for particular moments of the game. For example, a scenario where the player is a central-back and has to build up from the back, with a high-pressing game by the opponent, using 3 players in their first line of pressing. Easy integration with other Platforms. Beyond Sports (and probably other solutions too) can be easily integrated with traditional software for data analysis and tracking: Opta, Sportscode, STATS Prozone, etc. This allows anyone to create custom scenarios in around 1 minute. One Player. Multi-Player coming soon. At the moment, only one player can “experience” the scenario at a time. However, the ability to have multi-player games may be in test-mode already, and coming soon. Compared to the traditional tactic talks held by Coaches, it is very difficult to imagine a situation where a player wouldn´t be paying attention while using VR. He has no other choice than to participate. A study ran by the company with one top U19 Team in Holland yielded very good results: the percentage of good decisions increased by 20%, and the speed at which those good decisions were made decreased 1 second. In the following video, you can watch Sander Shouten, Beyond Sports´ CEO, with whom I had the pleasure to interact.